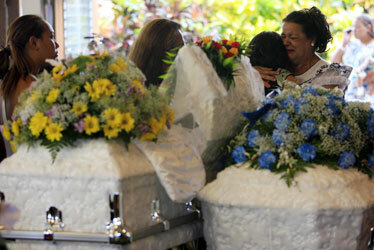 Mary Miles wept yesterday evening while being embraced by well-wishers during combined funeral services for her grandson, 3-year-old Koa Paka Miles, and her husband, Austin Miles, at Waianae Baptist Church in Waianae. Koa Paka Miles was killed May 15 in Nanakuli when the car he was riding in was struck by a drunken driver. Austin Miles died two days before of a heart attack. 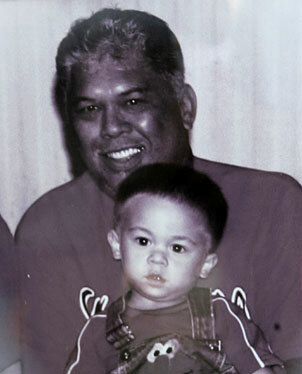 In life, 3-year-old Koa Paka Miles was always together with his 62-year-old grandfather, his "papa," Austin Miles. And now in death, family and friends believe the two are together again. "Like a sunflower, he brightened our day. I see the little smile on his face. I'll always remember my little pride and joy." The toddler was killed May 15 when a drunken driver speeding down Farrington Highway in Nanakuli lost control of his pickup, hit a guardrail and crashed into the Miles' car. Samuel Kamu Miles, wife Erica and a friend were also occupants. With two white caskets before him, Samuel Kamu Miles smiled as he spoke fondly and proudly of his father, Austin, and his son, Koa Paka, who died within two days of one another. Miles described his ill father as a fighter. "Even when they removed the oxygen, he was still fighting ... holding tight, holding strong." As for his son: "Koa Paka was very bright, very smart. He played his papa very good. ... He played us very well. "Like a sunflower, he brightened our day," Miles said. "I see the little smile on his face. I'll always remember my little pride and joy." A family photo of Koa Paka and Austin Miles. An estimated 500 to 600 people came last night to pay respects to the family at Waianae Baptist Church, including the family of the 25-year-old Waianae man, Sanford Valdez, who drove the pickup that struck the Miles' car. Before the services, Brown said that friends told him family members of Valdez, who also died in the crash, were in attendance. "It's real hard, but they had a loss in their family, too. From what I heard, they feel bad." 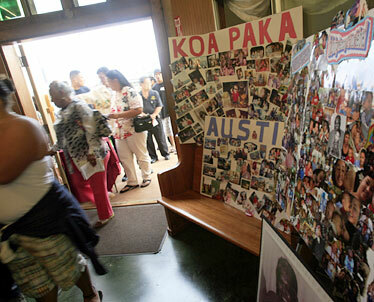 Many recalled the kolohe little boy with the smile that melted hearts. Tears rolled down the face of Koa Paka's godmother, Naomi Flint, 21, as she talked about the little boy who was "so joyous, so full of life, energetic, very smart." Grandpa and grandson "were never apart," she said. Faye Eleazar, 33, said when she heard the news of the accident, "I was devastated. We watched him grow up." 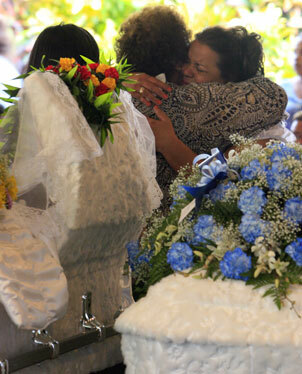 Mary Miles, right, cried yesterday while being embraced by well-wishers during funeral services for her grandson Koa Paka Miles and her husband, Austin Miles, at Waianae Baptist Church in Waianae. Koa Paka Miles was killed in a car wreck last week, while his grandfather Austin Miles died of a heart attack just days before the wreck. John Eleazar, a fellow member of the 100th Battalion with Kamu Miles, said he left work and rushed to the hospital when he heard about the crash. "We've been with them ever since," he said. They have three daughters, and their 3-year-old Zylah "always looks for him. They're playmates." Faye Eleazar said, "We told her that Koa Paka is with Papa Austin, and they live with Papa Jesus." John Eleazar added, "She asked, 'Are they going to come back?'" Austin Miles died eight days shy of his 63rd birthday. His sister Sarah Hohner of Austin, Texas, wished "he could've been here longer with us." She cried for 15 minutes on his shoulder before she returned to Texas after their mother's funeral last year. "Then the double tragedy," she said. "It hit me hard." Harry Faye Simons, pastor at House of Angels in Waianae, said, "I feel as though Austin knew the Lord and so did his grandson. They'll be frolicking in heaven." A photo collage greeted well- wishers at the entrance.